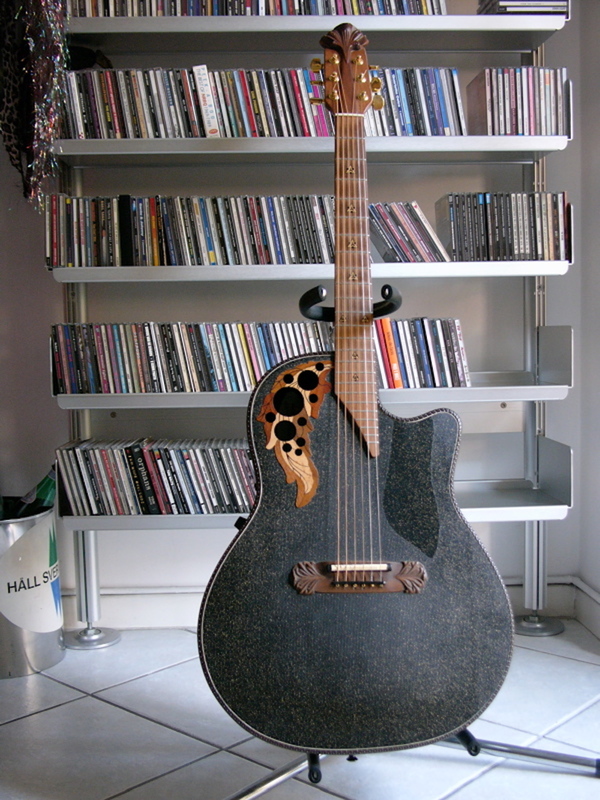 The Adamas (see the story here) is the Holy Grail of every Ovation enthusiast. The first I put my hands on is an Adamas 1587 that I owned, purchased from Gruhn Guitars in the early 90s. When I opened the box delivered by UPS I was so thrilled that I just stood there, staring at it for several minutes before having the courage to touch it. It was mint and beautiful. This Adamas 1587 is a single epaulet cutaway, the variant that I like the most (the simpler the better!) in the cutaway Adamas family, both for 1 and 2 models. I played it quite a lot, so it’s alive and resonant, but it still is in exceptionally fine condition. The neck is huge and straight, a good excuse to tune it in open G from time to time and play it with the slide. But I feel so good when I play and hear it that I always bring it back to a standard tuning, to enjoy its friendly feel and fantastic tone.